Quick Take: While 2014 Parabola is not the pinnacle of the Parabola series (that goes to the boozy complex and black cherry undercurrent having Parabola of 2012), it is an improvement over 2013, being smoother and less boozy. Warm, sensuous, delicious…Parabola is as close to bourbon-aged perfection that I’ve come across. Firestone has crafted and continues to craft one of my favorite liquids of all time. Brew Facts: Parabola was originally developed as part of Firestone Walker’s blended anniversary beer. When it was finally released on its own, it quickly gained a huge following, leading to the first bottling in 2010. It didn’t take long for this to become a coveted, highly sought after-bourbon-aged Russian Imperial Stout. I have a yearly vintage extending back to 2012 and can’t wait to break out a vertical once I obtain the 2015 release (I like to age beers 3 years). Although unlikely, I’d love to track down 2011 and 2010 for the full experience. 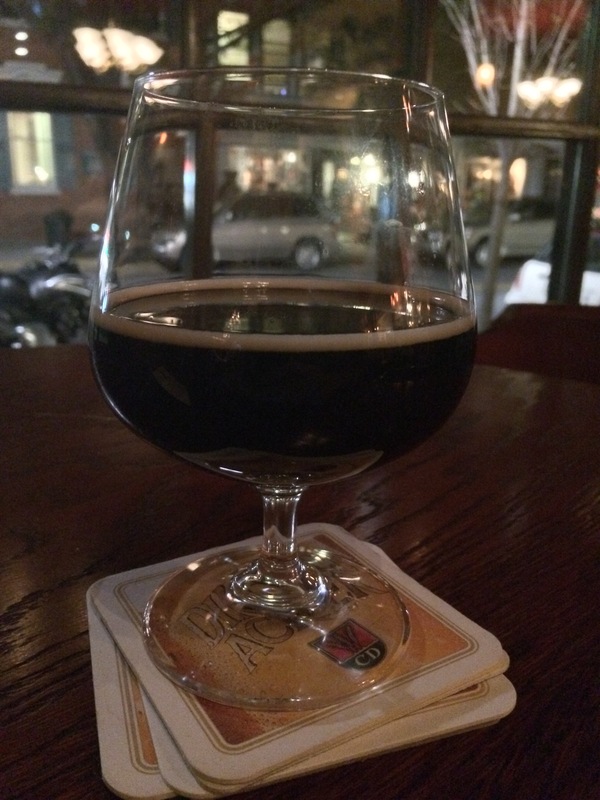 An EXTREMELY limited, draft-only version of Parabola exists, referred to as Parabajava. It’s brewed with an espresso blend from Intelligentsia Coffee Company, the same company that supplies Goose Island with the coffee for Bourbon County Coffee Stout. I think I have a new impossible to find whale beer. Appearance: This is my first bottle for 2014 and what better time to break it out than my dad’s 65th birthday. It pours out dark, oily and as flat as can be. A little ruffle of foam builds up on the glass edges, but this is as still as it gets. Swirling leaves a surprisingly clear film that coats like ectoplasm. Not much to look at, but has the sufficiently dark heart of a RIS. Aroma: A swirl and sniff finds buttery bourbon and dark fruit goodness. Beneath the blanket of buttery fruits is oak, vanilla, cocoa and an alcohol burn that opens up the nostrils. Not astringent levels, but it definitely sends signals to your liver to get revved up for what’s coming. It really is a bourbon first aroma with the typical RIS aromas slipping through with intensely focused nasal concentration. Taste/Mouth Feel: A quick toast and I get acquainted with the 2014 version of my favorite RIS. I feel the weight of it in my mouth and can quickly say that it meets my lofty expectations. Cough syrupy level of viscous thick malts, but retains a smoothness that is a few microns heavier than velvety. Taste is like a warm mug of toffee and caramel, with flares of anise, tobacco, and vanilla that float though this liquid dream. Not to be forgotten, a cheek warming alcohol rises on the finish along with sticky sweet molasses, roast, charr and light plum. The finish is drier than 2013 Parabola and close to perfect, dropping the heat quickly and letting the roasty molasses ride on. The huge booziness from past versions is better blended, making for an eminently quaffable bourbon beer. An amazing sipper that tingles the lips and tongue with spicy bourbon and deep, classic RIS flavors. Final Thoughts: Clearly, I like his beer. While 2014 Parabola is not the pinnacle of the Parabola series (that goes to the boozy complex and black cherry undercurrent having Parabola of 2012), it is an improvement over 2013, being smoother and less boozy. With all this praise, one needs to approach this beer with the understanding that Parabola doesn’t take imperial stouts to a place that no stout has gone before. What it does do is expertly craft a traditional RIS and bourbon-age it into a refined, layered experience. Warm, sensuous, delicious…Parabola is as close to bourbon-aged perfection that I’ve come across. Firestone has crafted and continues to craft one of my favorite liquids of all time.